The roof was designed with Marazzi’s D_Segni Color Collection in Honeycomb. The designer of the doghouse was Sarah Morales of Marazzi and American Olean. The tile installer was Albert Pena of Mecca Design. Orlando, Fla.—As part of The Tile Council of North America’s (TCNA) doghouse donation to a local charity during this week’s Coverings tradeshow, the Marazzi and American Olean brands teamed up to produce a custom tiled doghouse that showcases the distinct personality of each brand and provides some lucky dog with a house that is the epitome of on-trend style and fun. 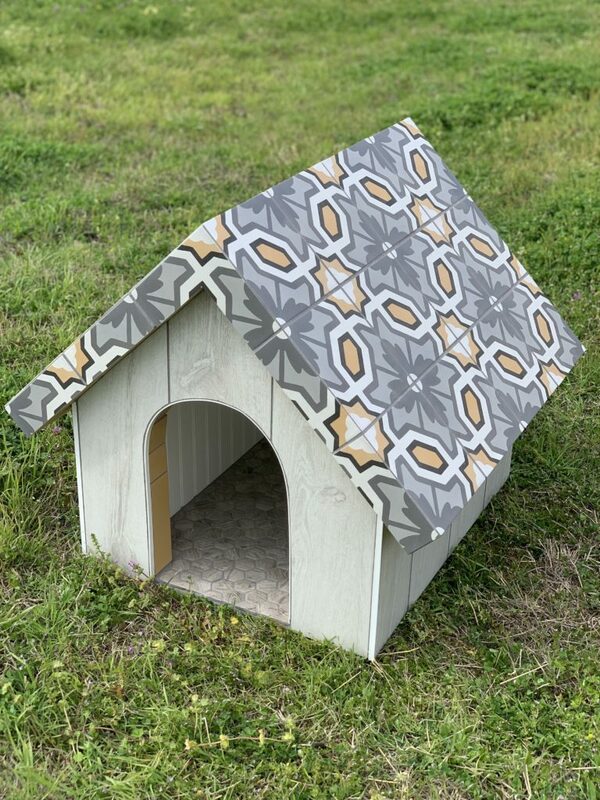 The Marazzi, American Olean doghouse joined several others donated by fellow TCNA members, which are on display during Coverings in the TCNA Art Tile Courtyard. Following the show, all doghouses will be donated to the Pet Alliance of Greater Orlando, an organization dedicated to improving the lives of Orlando-area pets.